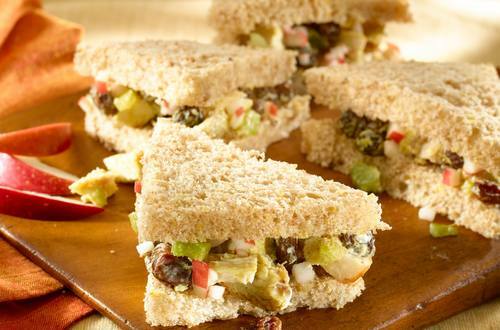 1 Combine chicken, Hellmann's® or Best Foods® Real Mayonnaise, apple, celery, raisins and curry powder. 2 Spread evenly on 4 bread slices, then top with remaining bread; cut each into 4 triangles. 3 Garnish, if desired, with thin apple slice.